Among the new scripted projects in the works for ABC Family is the multi-camera comedy by Dan Berendsen, Baby Daddy. The cable network released some photos from the half-hour series, which received an order last month. Check them out ahead! ABC Family calls Baby Daddy their highest testing comedy pilot ever. 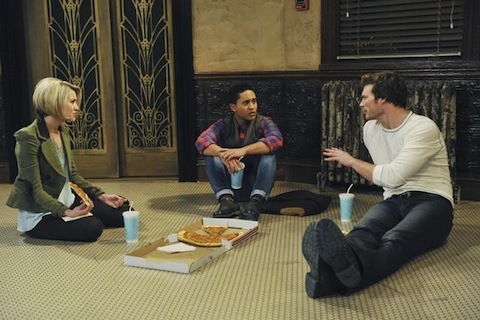 It’s set to star Chelsea Kane, Tahj Mowry, and Derek Theler, and sounds a little bit like Fox’s Raising Hope in that it follows a man who learns he has a baby daughter when she’s left on his doorstep by his ex-girlfriend. He decides to raise the baby, with the help of his mother, brother and friends. It doesn’t look like ABC Family has a premiere date for this series yet, but production is set to begin this spring.